I can barely contain myself as I type up this blog!! We ("we" includes all +EDCoalition1 Member Organizations and every single advocate (aka: EACH OF YOU)) just got HUGE news from Congressman Ted Deutch's office regarding +Centers for Disease Control and Prevention (CDC) and our advocacy on school-based BMI screening, surveillance and reporting! When I had the honor of becoming the EDC's Policy & Communications Director on June 1, 2014, the EDC President, +Johanna Kandel, and I immediately agreed that BMI screening in schools was an issue we wanted the EDC to champion on behalf of families, treatment providers, researchers, sufferers; on behalf of ALL those impacted by school-based BMI screening. We had heard too many horror stories from parents, students, school nurses, teachers and others, about some of the ways this practice was taking place in so many schools, and we knew that something needed to be done to put an end to the irresponsible and oftentimes harmful screening practices. 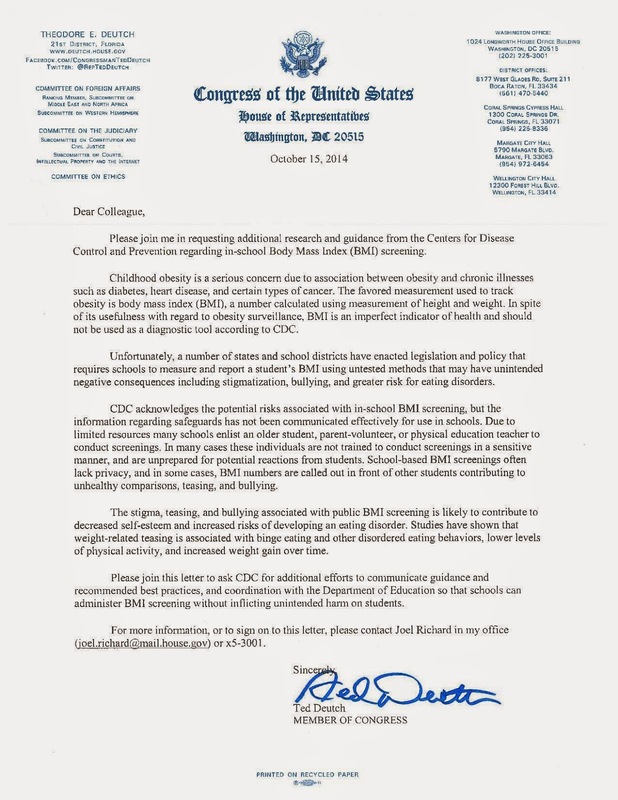 In early August 2014, Johanna and I met with Joel in Congressman Deutch's office to describe the problems that many of you had relayed to us in private conversations and emails in which you detailed the unsettling (at best) ways that your child, you, your best friend, etc., had endured a BMI screening in school. Joel listened to us detail your concerns and immediately took the issue to the Congressman. The next thing we knew, Joel let us know that the Congressman was willing to author a Dear Colleague letter to address the issue with CDC. Thanks to the Congressman and Joel for their hard work, they provided us the Dear Colleague letter in time for our fall National Lobby Day so that YOU could fight back against this practice by asking Members of Congress to sign their name to the letter and get the attention of CDC. That CDC has acted so quickly is NOTHING SHORT OF AMAZING (miraculous really); rarely do things happen this fast on Capitol Hill. CDC responded so quickly in large part because of YOUR ADVOCACY!! HOWEVER, despite the immediate action by CDC, there is more to be done and we need you to help ensure CDC follows through on the requests of the Dear Colleague letter (which was updated since Joel's conversation with CDC...you can find the revised letter here) We need you and your friends, family, colleagues, clients (if appropriate) to call your Member of the House of Representatives and ask them to sign on to the Dear Colleague letter by Close Of Business (COB), Monday, October 27, 2014. To each of you, for all of your advocacy and belief in the EDC addressing this issue for you, with you, together, I cannot say thank you enough for allowing us the honor of championing this cause with you on Capitol Hill. But we must not yet rest yet. We must make our calls. We must get as many signatures as possible by COB, Monday, October 27, 2014. We must...we can...we will...together. The Eating Disorders Coalition is so very appreciative to the following organizations and researcher for their collegial spirit in collaborating with us to create the "Facts and Concerns About School-Based BMI Screening, Surveillance and Reporting" document. Without your expertise and dedication to working together as a group to flush things through and suss things out, the document would not have come together so thoroughly. Thank you: The Academy for Eating Disorders (AED), +Binge Eating Disorder Association, +F.E.A.S.T. Videos (Families Empowered and Supporting Treatment of Eating Disorders), Strategic Planning Initiative for the Prevention of Eating Disorders (STRIPED) and +kendrin sonneville. Great news! So encouraging to see that our voices make a difference! I will encourage my readers to contact reps before Oct 27th! Thank you for all the hard work on our behalf!